HEADING HOME charts the underdog journey of Israel's national baseball team competing for the first time in the World Baseball Classic. After years of defeat, Team Israel is finally ranked among the world's best in 2017, eligible to compete in the prestigious international tournament. Their line-up included several Jewish American Major League players―Ike Davis, Josh Zeid and ex-Braves catcher Ryan Lavarnway―most with a tenuous relationship to Judaism, let alone having ever set foot in Israel. Their odyssey takes them from Tel Aviv and Jerusalem where they are greeted as heroes, to Seoul where they must debunk their has-been, wannabe reputations. With their Mensch on the Bench mascot by their side, the team laughs, cries, and does much soul-searching, discovering the pride of representing Israel on the world stage. "An unlikely miracle team tale that will win you over. Enjoy "The 'Oys of Summer." 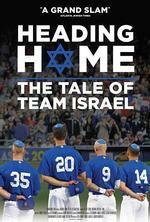 "
"HEADING HOME is a film that will tell the legend of Team Israel for years to come."